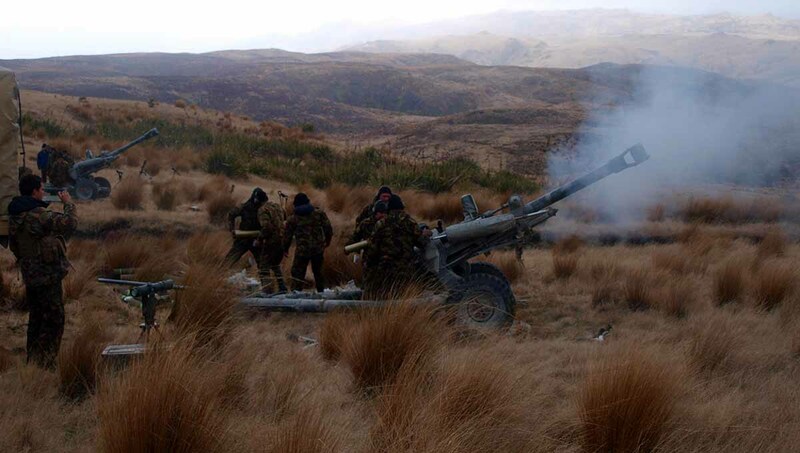 On Saturday 15 September 2012, 18 retired gunners from the RNZA Association were hosted on the gunline during a live firing exercise by 161 Battery, 16 Field Regiment in Waiouru (just off the Carbuncle Track to be a bit more precise). Exercise BEN CAT was a tactical exercise in support of D Company, 2/1 RNZIR, and was also used by the Regiment and the School of Artillery for assessment of various key appointments in the Battery. This great occasion for the Association members took place 47 years after OPERATION BEN CAT, and nearly to the day (14 September) when 161 Battery received its first operational casualties in VietNam. 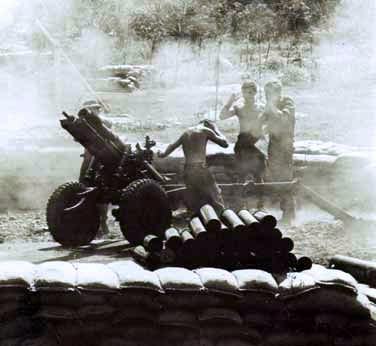 'The first major operation for the Battery (in VietNam) was a 14 day deployment named after the town closest to the gun position BEN CAT, over the period 14-28 September 1965. This operation was also a first for 1RAR which was participating with 161 Battery in what proved to be a major change in United States strategy in Vietnam, namely taking the war to the Viet Cong. Operation BEN CAT was the ANZACs` introduction to US `search and destroy` operations. These were characterised by saturation infantry patrolling and rapid tactical movement of the guns by Landrover, APC and Iroquois helicopter. 'Operation BEN CAT began tragically. During the road move south east of the town of Ben Cat, Sgt Al Don, and Bdr Jock White were killed when their vehicle, the 6th in the Battery convoy, was destroyed by a command detonated mine. Both men were decorated posthumously by the South Vietnam Government with the Cross of Gallantry with Palm, and the Medal of Honour with Merit. 'In keeping with search and destroy tactics, the battery was moved rapidly five times during the operation. The third deployment required tracked APCs to reach the position, as the Viet Cong had destroyed the road by cratering and in the prevailing monsoon rains the heavily laden Landrovers were incapable of moving cross country. It was also at the third position that the VC probed 161 Battery`s protecting Australian infantry company. 'Captain Murphy called down supportive fire and by body count, the Battery had killed eight VC and wounded two others. The deployment from this position to the Battery`s 4th gun position was, to quote the GPO '. . . a well organised muck-up'. 161 Battery was to be heli lifted out at 1000hrs on 23 Sept, however the choppers did not appear until 1500hrs. In the intervening five hours the Battery anxiously waited, the guns in pieces, ready to go. 'To add to the difficulties, the helicopter pilots arrived either unbriefed or simply disregarding the loading and unloading plans by randomly picking up guns and stores and depositing them in a jumble around the next position. The GPO in particular was pleased to see the arrival of the BG and Battery vehicles in order to return his reassembled guns on 28 Sept to Bien Hoa. I feel sure that Graham Williams, the GPO during 'Operation' BEN CAT, would have been very happy with the Battery`s performance on 'Exercise' BEN CAT; with the GPO, Lt Catherine Dymock, performing her duties in difficult conditions (she is the RNZA Assn`s rep with 16 Fd Regt), the gunners of 161 Battery Able and Baker Troop on the gunline operating very professionally and extending wonderfully warm and generous hospitality to the grey haired visitors, and the Officers and Warrant Officers of 16 Field Regiment who hosted the group to a wonderful evening in the mess. The gunners of the 'Operation' BEN CAT era can rest assured that the gunners of the 'Exercise' BEN CAT era are maintaining the standards and traditions of the RNZA as they would wish, marvellously! To the Commanding Officer, Matt Weston, and all the members of 16 Field Regiment, we sincerely thank you for allowing us to be a part of your lives for a day. I`m sure those who took part will not forget it, and I`m sure the number of hopeful attendees will increase from year to year.